The iPad has proven a tablet can be a powerful tool for music. It’s also been mostly alone. Android-powered tablets have suffered from lackluster audio performance. Compound that with low popularity in the marketplace and fragmented OS updates, and the platform has largely scared music developers away. Android devices also lack the richness of the iPad’s hardware accessory support, with multi-pin ports that lie dormant, giving accessory makers insufficient capabilities. Windows-powered tablets thus far show some promise, but absent high-quality multi-touch input or thinner form factors, they’ve also been a non-starter. 2. You get reliable, low-latency audio. The OS tools that make this work involve a number of dimensions – things like the ability to prioritize audio threads and to avoid slow, clunky OS-wide mixers. But you care about the upshot. On desktop Windows, we know you can get the sort of audio performance that makes music apps usable. 3. You can use other hardware. MIDI keyboards, audio interfaces – okay, whether or not you can use all of them, you probably want to occasionally use some of them. But items #2 and #3 are really essential. Without them, there’s no incentive for developers to make new applications. (What would that look like? Ask an Android user or developer.) So the question is, can you get anything like these three points on the non-“Pro” tablet, too? Microsoft’s two tablets cover two very different scenarios. One runs Windows 8 – the real deal. That tablet, called the “Pro,” is thicker, heavier, and pricier – but it might also be a no-compromise, serious audio machine that justifies extra weight and cost for musicians on the go. Microsoft says the price will be comparable to an “ultrabook” PC; I’m guessing that’s closer to US$1000 than the iPad’s US$500 sweet spot. It’s even based on Intel: think ultrabook guts in a tablet body. The other tablet is, well, more like an iPad – ARM processor, slimmer, lighter, and with a “tablet”-style cost, says Microsoft. The slimmer Surface – and the development underpinnings for this new Metro and WinRT business – are really the wildcards here. Now, get ready, because everything about the naming scheme here is confusing. Let’s explain. Whadaya Want, Windows or Windows? Surface, not Surface. This is “Surface,” just like Microsoft’s multi-touch table Surface, but … there’s no relation. Surface is now the name for Microsoft-produced tablets running Windows. Windows 8 applications, but not Windows 8 applications. Here’s where things get more critical. 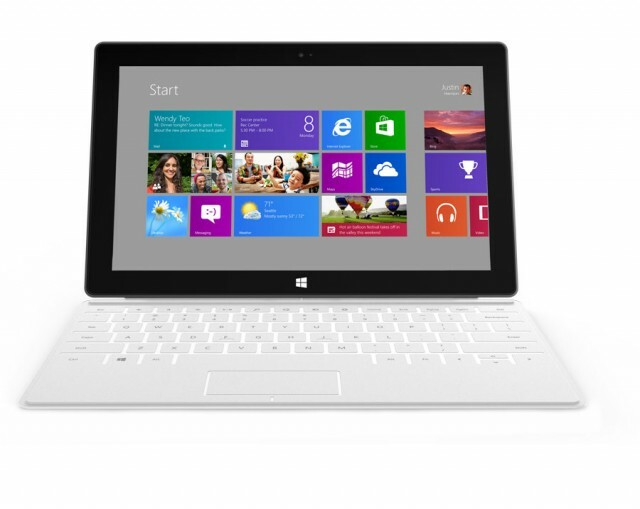 Microsoft touts “Windows 8” applications on these tablets, but they mean two different things. There are essentially mobile tablet applications, built for ARM, powered by WinRT. Then, there are the Windows 8 “Desktop” applications. WASAPI, but maybe not WASAPI. It may sound like we’ve entered a sushi restaurant, but stick with me here: this is about whether audio developers can build viable apps for this platform. Various readers have pointed out to me that WinRT (and applications built in it for this Windows RT tablet) does support Windows’ WASAPI stack for sound. The problem is, it’s a specific mode of WASAPI – Exclusive mode – that some developers believe is necessary to deliver lower latencies you need for many music apps. Or, at the very least, WASAPI alone isn’t enough; the question is how audio signal is routed between the application and the user, and whether it has to compete with other threads or is routed through a mixer in such a way that adds latency overhead. Human translation: The ARM tablet edition of Windows 8 may well be crap for sound, possibly even more so than Android. This is a longer discussion, though, and the reason I keep qualifying these statements is that we’re looking for more detailed, more finalized information. But the alternatives are this: either these tablets add the high-performance features desktop Windows has, or Microsoft is doing exactly what Google and their partners did: they’re leaving creative music and high-quality sound to be the exclusive domain of Apple. USB, but not USB. Then there are the USB ports. There are USB2 ports on the basic model, and USB3 ports on the Pro model. But will those support class-compliant MIDI, like the iPad does? The Pro model should, if it really is running the full version of Windows 8. The ARM model probably won’t, unless we get some new information. Other hardware could be supported if you can install drivers. Again, it seems likely the Pro model will allow you to do so, and the other tablet won’t. Sound, but not good sound. Windows isn’t perfect – indeed, there’s no shortage of griping about any of the major OSes. But it does on some level solve some of the needs of musicians. The question is whether the “Windows” on these tablets will do the same. In a way, it’s even riskier than what Apple or Google has done. The iPad doesn’t run Mac OS; Android, too, runs something new. But Microsoft is calling this a “Windows” tablet. Musicians may find that that doesn’t mean what it’s meant in the past. There is no reason a tablet can’t deliver low-latency, reliable audio for music applications. In fact, if people who knew something about audio ran the world, I think you’d see much more rigorous specifications for sound in general. Even telephony applications benefit from better performance – high latency and stuttering audio causes problems in voice calls. It’s something an average user is likely to notice in real-time applications, whether or not they’re a music pro. We’re talking primarily about the ARM tablet here. If it delivers 100 ms latency in real-world applications, it’s a non-starter, and it’s time for those of us who are music lovers to start giving Microsoft and Google a piece of our mind. If it can do some of the things the iPad does – like give developers solid audio APIs and usable latencies, and, if we’re lucky, hardware support – then it’ll be worth talking about. There’s more reason to be optimistic about the Pro tablet. 1. Has Microsoft got a viable alternative to the iPad in its slimmer Surface tablet? Can it hold a tune, or is it another tone-deaf entry that guarantees Apple will be the only company who makes stuff musicians want? 2. Does the Pro tablet deliver the full Windows experience? 3. Will WinRT development on either tablet let you make good music apps? Signs look petty good for the Pro. And that makes yesterday’s announcement a potentially good thing. It wouldn’t be the first tablet to run a desktop OS, but looking at the design, it might be the first on you actually want to use. That means a whole lot still rides on finding answers to all three of these questions. Even the absence of information is itself frustrating. The reality is this: Apple has a fantastic $500 tablet you can buy right now, and it’s got desktop-class audio support that makes responsive music apps fun to write, surprisingly-decent support for audio and MIDI hardware, and an impassioned audience that loves buying apps. So, uh, yeah: that means the onus of proof is on Microsoft, not Apple. We’ll be watching. Clarification: To be clear, high-latency performance on WinRT-based (Metro) apps would impact both tablets. It simply seems that only the Pro tablet lets you produce desktop apps. Yes, as commenters note, you’d want an app designed for the tablet, in order to justify using a tablet at all. But there’s no reason a developer has to use Metro and WinRT to make a touch-friendly app. Desktop Windows apps can support touch; it’s simply a matter of designing your user interface around that paradigm. Oh, yeah, and one more question: Anyone else wondering what the bootloader is like on these two tablets? Linux, anyone? (It runs on ARM and Intel without issue. Cough.) So far, yes, it looks like at least the non-Pro tablet has a locked-down bootloader. Unknown: whether the Pro will, as well, and whether it will be possible to “jailbreak” the tablets to run alternative operating systems.